A solid choice for Indian food, New Delhi Palace offers a range of well-prepared dishes. 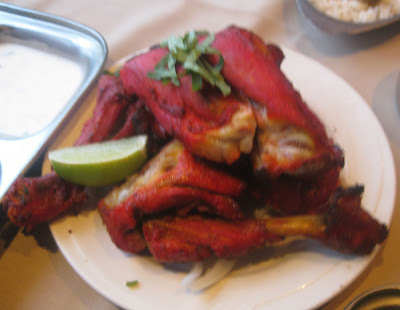 The Tandoori Chicken is a must-try. Nick and his brother Bobby keep New Delhi Palace on hand as one of their solid dinner standbys, when they're not in the mood to try something new and just want to enjoy Indian food, knowing that the items will be delicious. Bobby describes the restaurant as "top tier." Nick says it's a "solid 8." Located in a small two-story restaurant complex just outside the South Lake District of Pasadena (with free parking in a shared lot on Mentor), New Delhi Palace is on the second floor and marked with unassuming exterior signage. It has an unusually tall door, which on the inside is decorated with a Hindu goddess statuette. During daylight hours, light streams in through the large windows that overlook Colorado Boulevard. The owner is frequently present. On this occasion, he gestured to our empty naan basket and asked if we wanted more. 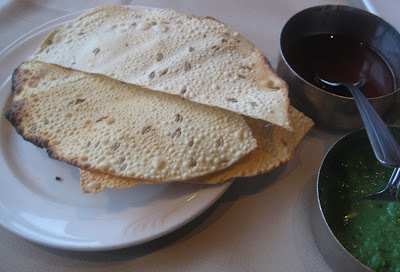 The meal begins with complimentary Papadum and Chutneys. The Tandoori Chicken is a-ma-zing. It is succulent, with a precise balance of flavors that dances in your mouth. It may be the best tandoori chicken I've ever had. Usually I'm good at sharing food with others (especially since I always expect people to share their food with me :) ), but with this chicken I kept tearing off more and more pieces from the center plate, trying to be subtle because I was embarrassed to be eating so much. Normally, we order several dishes and share them family style, but this time we tried something different: the Thalis. 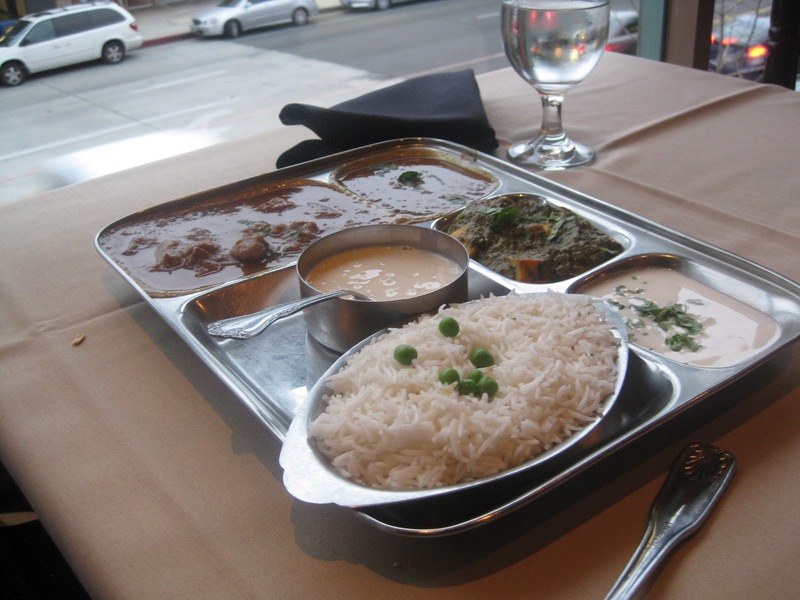 It's essentially your own individually portioned metal plate that resembles a meal you might have at a home in India. 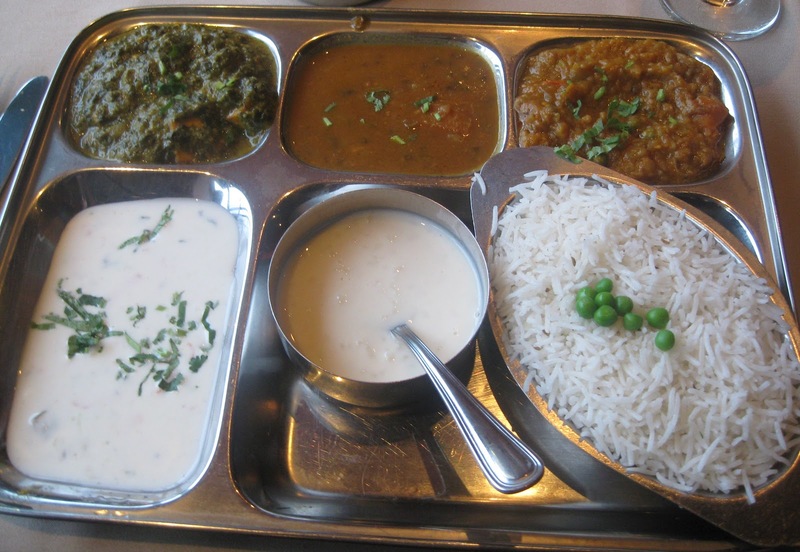 Here, the dinner thalis are $14 for vegetarian and $18 for non-veg. The non-veg plates include the tandoori chicken served on a separate platter (above, which, since I got the veg thali wasn't actually part of my meal, but Nick said I should try his anyway and then I promptly got hooked), and all the thalis include naan served on a separate platter. 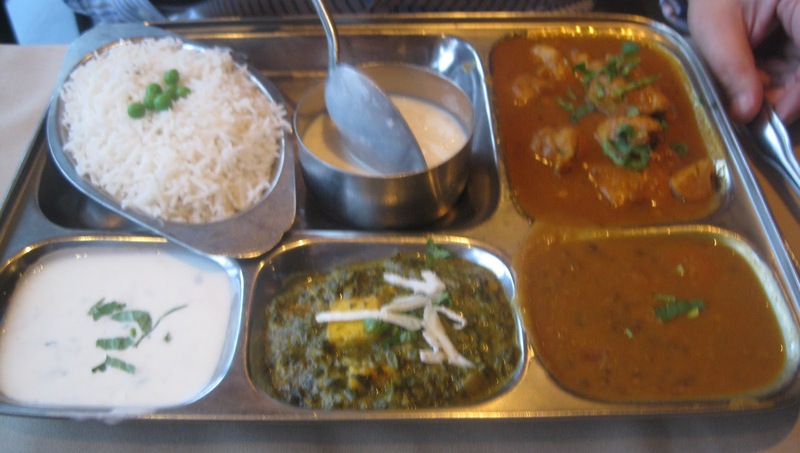 Shown here is the Lamb Curry option (one of two options for the non-veg thali), which Nick ordered. 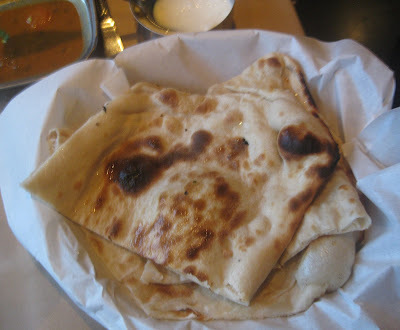 Here is the naan basket, which was tasty and which we quickly gobbled up. Bobby got the non-veg thali with Chicken Curry, the other meat option. If you're new to Indian food and you don't have the option of a buffet, I'd recommend ordering a thali, especially if you're by yourself and so can't do family style dining, when available. Like a buffet, the thali lets you try several different menu items for one set price (and hopefully means you'll enjoy at least one of the items on your plate). My veg thali included rice, which wasn't seasoned but whose grains were nicely separated, lending it to a pleasing texture. The lentils were my favorite item. I didn't pour them over the rice cause I knew I wouldn't eat all my rice and I didn't want any delicious lentils to to go waste. However, since I didn't pour them over rice, the watery texture made them difficult to eat with my fork. I usually love eggplant but this preparation was too mushy. Plus, the onions in it were mushy too, which made the eggplant and the onions indistinguishable from each other. I'd ordered my thali "mild," and the eggplant had more of a kick than I expected. Nick loved the Saag Paneer. After he finished his, he kept digging his fork into mine. Personally, I thought it needed more cream. I enjoyed the Raita. It was refreshing. I find I'm liking raita more these days. The other plus about the thali is this one included a dessert. The rice pudding was delicious. I'll join Nick and Bobby and add New Delhi Palace to my list of standby Indian restaurants. If you're in Pasadena or the surrounding areas, I recommend you make lunch or dinner plans here soon. 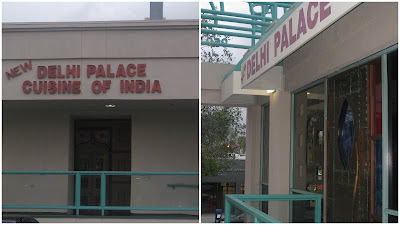 New Delhi Palace, 950 E Colorado Blvd, Pasadena 91106. (626) 405-0666. Select a theme which requests to you. Choosing a theme frequently takes as much study as the dissertation itself. I enjoy price every region on the size of just one in order to 10 along with 10 becoming the greatest degree of brazilian hair (your own nirvana) as well as 1 as being a reduced or even absolutely no degree of fulfillment. I quickly recommend going for a great difficult take a look at every region to assess the actual move. Know what might need to occur or even alter for that move to become decreased or even removed. For instance: Should you ranked your job the 7 from 10. Exactly what might help to make your own fulfillment degree together with your profession the 10? Possibly much more customers, much less journey time for you to function, a much better romantic relationship together with your employer, and so on. As soon as you’ve recognized every item that may credit card debt inside your degree of fulfillment you have to spend on motion. Getting actually 1 motion may proceed a person 1 action nearer to a greater degree of fulfillment for the reason that region in your life. Ideals Examine : Understand what’s vital that you a person. Becoming truly obvious regarding your own ideals as well as what’s most significant for you can help you make smarter choices more regularly. Help to make a summary of what’s most significant for you that you experienced at this time. After that position every thing about the checklist through greatest concern in order to cheapest concern. Have a truly near take a look at your own best 5 ideals. They are your own most significant ideals. Exactly how carefully aligned corectly tend to be these types of best 5 ideals in order to the way you spend time daily? Exactly what are you currently overlooking that’s important for you? Numerous prosperous individuals place just as much period as well as believed in to exactly what these people perform within their period aside brazilian hair sale your place of work because they perform on the job.